This is Professor Jim Al-Khalili introducing world-renowned physicist Professor Sir Roger Penrose, guest speaker at the inaugural Lewis Elton Lecture at the University of Surrey on the 16 February 2012. According to currently standard cosmology, the universe started with a Big Bang, immediately followed by a fleeting moment of exponential expansion, called “inflation”. Following this it settled down to a more sedate expansion, but due to what is called “dark energy," it is currently commencing a second period of exponential expansion that is expected to continue indefinitely. In this talk I describe an alternative idea, which argues that this picture provides merely one aeon of a continual succession of such aeons. The Universe never collapses in this model, but the remote future of each aeon becomes, when infinitely scaled down, the big bang of the next. Collisions between supermassive black holes in the aeon previous to ours would, according to my model, provide disturbances that should be just about observable in the cosmic microwave background of our own aeon. In this talk I shall describe evidence indicating that these disturbances may actually be present, and possibly providing us with some hint of what the aeon prior to ours may actually have been like. The talk will be largely free of equations, depending mostly on pictures, but a brief summary of the equations needed for the theory will be provided at the end. Jim Al-Khalili is a Professor of Physics and the Professor of Public Engagement in Science at theUniversity of Surrey. Jim has been a very busy chap. 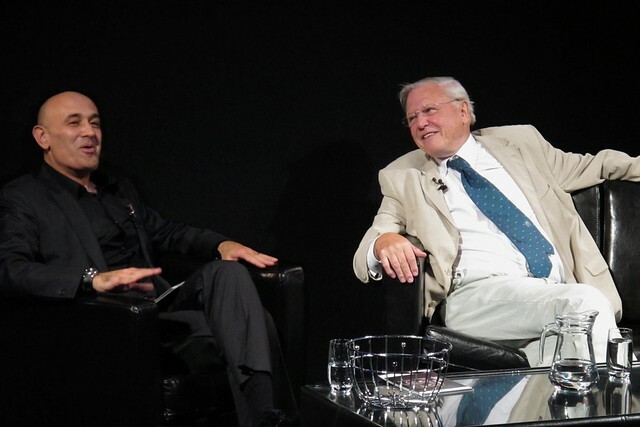 As well as making some excellent programmes about science for the BBC, he has hosted two public interviews at the University this year as part of his “Jim meets...” series, the most recent being with Sir David Attenborough on 27 October. I was lucky enough to be in the third row of the audience and thoroughly enjoyed listening to the great Sir David - a national treasure for sure. I took a few photos on the night and Jim used this one on his blog, so I thought I’d better link to it.